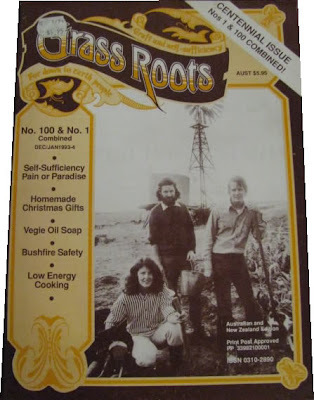 I was about 15 when I discovered Grass Roots Magazine. It really appealed to my burgeoning inner hippie and over the last 20 years of reading it – I have learnt all matter of things pertaining to living a self sufficient lifestyle. Everything from keeping chooks and growing veggies to composting, cooking and building using alternative materials like straw bales. I am torn you see – between the life I live in the city and the romantic life I dream of in the country. When I was 19 I took myself off with my dreadlocked surfer dude boyfriend to live down near Warnambool for a year. Thirty km from the nearest shop – we lived very simply in a small house on 5 acres of bush land with no electricity or running water. I spent most of my time tending my large veggie garden, restoring antique furniture for myself and others and making beaded jewellery which I sold at a couple of shops in town. We ate eggs from the chooks and veggies from the garden and made all our own bread. I have such fond memories of this year – I was young, idealistic and full to the brim with enthusiasm. My few years of reading Grass Roots had given me the basics of living a simple wholesome life and here was my opportunity to have a good go. As it turns out the year went quickly and the reality of my life journey ahead meant that I had to return to the city to begin my studies in Interior Design and well my story just goes on from there really. I have lived in the city ever since and have often thought of a move back to a lovely country town. I don’t think I would choose to live without running water and electricity again (especially not with children) but I have thought that a move to the country would bring about a simpler and somewhat less stressful lifestyle. Having said that though – I totally love living in the city and the opportunities that come with that. Perhaps as they say ‘the grass is always greener’ and I should just try to be happy with where I am right now. I fully understand Morgan where you are coming from. Some of us have this inner desire to live life closer to nature and away from the mainstream treadmill.As you say, when children are involved, it gets a little more tricky, but the simple pleasure of feeling connected to the earth and working in tune with nature is something that is so rewarding. Its educational, empowering and fulfilling. Your sleep is more restfull and your heart is content, thoughts of 'keeping up with Jones' soon evaporate. I've just GOOGLEd for the GRASS ROOTS magazine as I was wondering if they still exists and came across your blog. Yes, I used to read them too many years ago before I actually left the city. Now that I have retired to the country, every day is a GRASS ROOTS day! City or country, it doesn't matter where you go, things don't change all that much because wherever you go, you take yourself with you! Is this magazine still active? Does anyone know? Yes! You can buy it at your local newsagent. Yes still available and as important as ever! I love this mag...started reading it in the late 70's.